Two Little Flowers: My Pin Cushion Arrived! The pin cushion that Rachel made for me finally arrived, after 2 weeks in transit....Yay! Isn't it just gorgeous?! 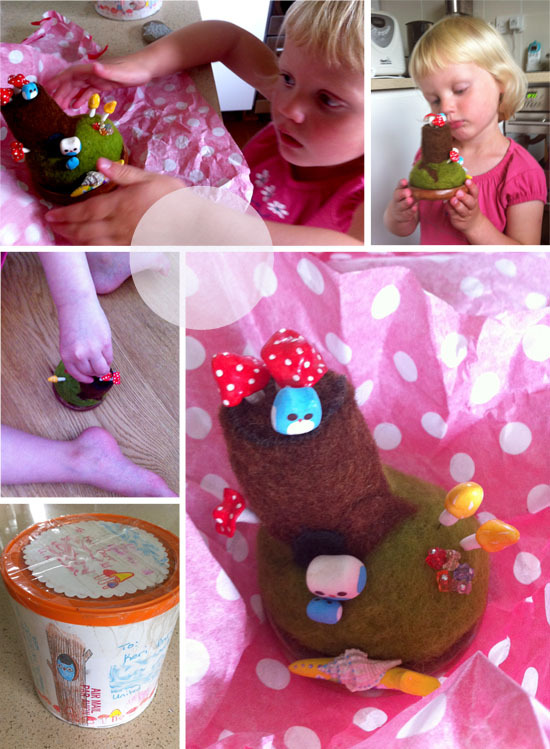 She made it all herself, including dying the wool and molding all the mushrooms, owls and the snail. I love it. As you can see, Ava loves it too - in these pics she is pretty darn well absorbed in un-pinning and re-pinning the whole thing. I couldn't find my proper camera in the rush to open the cute packaging and so had to resort to my phone camera before Ava rattled the tin to death. There are much better photo's over on Rachels blog and a nice description of how she put it all together. Isn't she just so clever? You can see what I sent Rachel over here.